The Carbon Bombshell is a variation of the discontinued Nuke Carbon front intended to answer the needs of suspended mountain riders. The manufacturing steps are the same, however the hub core is larger in diameter. From 22.5mm in the Carbon up to 30mm in outer diameter for the Bombshell. The flanges are made the same but must accommodate the larger core tube. The reason for the enhanced flange and core tube diameter is to allow the axle diameter to increase from the 9.5mm up to a 17mm outer diameter axle capable of with standing the suspension riders punishment. The axle is machined with four spiral flutes designed to reduce the weight of the axle. The Carbon Bombshell uses the same sealed bearing cartridges and lock rings as the Carbon front. The Carbon Bombshell hub has a 50mm hub flange diameter, with flanges spaced 73mm apart. The Carbon front spoke holes have a 42mm center circle diameter. 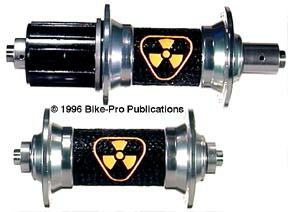 The Nuke Carbon Bombshell front is available in either a 28, 32 or 36 spoke hole drilling. The Carbon hub shell core is Brown in color. Both flanges, and the collars are anodized in Silver. The weight of a 36 hole Carbon front is 112.5 grams. This is the final variation of the Carbon hub series. Again using similar techniques, the Carbon Freehub uses the Shimano XT or XTR freehub mechanism for its ratcheting freehub system, insuring Shimano compatibility. The core for this hub is the 22.5mm diameter version that we saw in the Carbon Front & the Carbon Freewheel. The freehub mechanism is held in place by a steel bolt that threads from the interior inwards, and seats into the drive side flange. At the outer end of the Shimano mechanism, Nuke Proof has a machined aluminum bearing carrier. This carrier threads into the freehub mechanism holding a sealed cartridge bearing at the extreme outer end of the freehub body. Like the Nuke Freewheel hub, this has the same stainless steel axle, precision machined to 9.5mm outer diameter. Aluminum spacing collars are used establish the amount of axle exposed on each side. Machined of aluminum, they are held in place by a tiny recessed hex head set screw. The Shimano XTR freehub is used on a 130mm (Road) or 135mm (MTB) axle to make an 8 speed cassette rear hub. The Carbon Freehub rear has a 38mm hub flange diameter on the non-drive side, and a 54mm diameter on the drive side. The flanges are spaced 56mm apart. The Carbon Freehub spoke holes have a 32mm center circle diameter on the non-drive side and 48mm on the drive side. 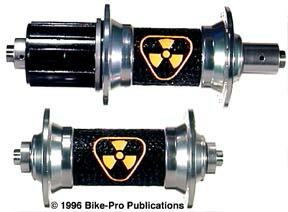 The Nuke Carbon Freehub rear is available in either a 32 or 36 spoke hole drilling. The core is Brown in color. Both flanges, and collars are Blue, Green, Lavender, Red, or Silver. The weight of a 32 hole Carbon Freehub with a 135mm axle is 295.5 grams. Please specify the axle length, and then the desired gearing, as well as hole drilling and color.